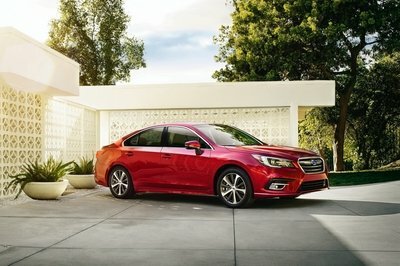 Subaru celebrates 50 years of selling vehicles in America with an appropriately named 50th Anniversary Edition lineup, including the Legacy sedan. Each model receives similar treatments of Heritage Blue paint, satin chrome accents, and an embroidered interior with the unique 50th Anniversary logo. 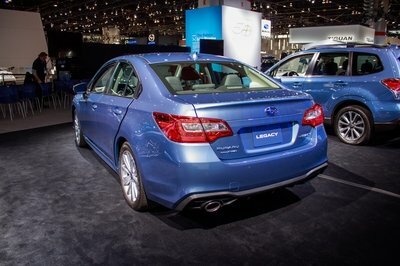 Subaru is producing a limited number of each anniversary edition model, with the Legacy limited to 1,050. Of those, 800 will be the 2.5i Limited trim, while the other 250 are the 3.6R Limited. 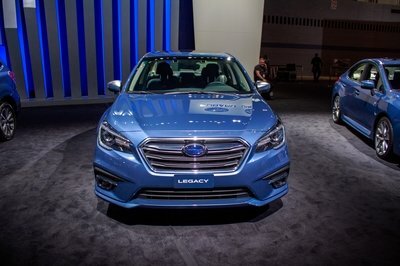 Subaru chose to base the 50th Anniversary Edition on the Legacy’s range-topping trim, the Limited, so each example will pack tons of standard equipment and features. Subaru’s EyeSight driver assist package is included, meaning active safety features like adaptive cruise control, pre-collision braking, lane departure and sway warning, and lane keep assist are present. 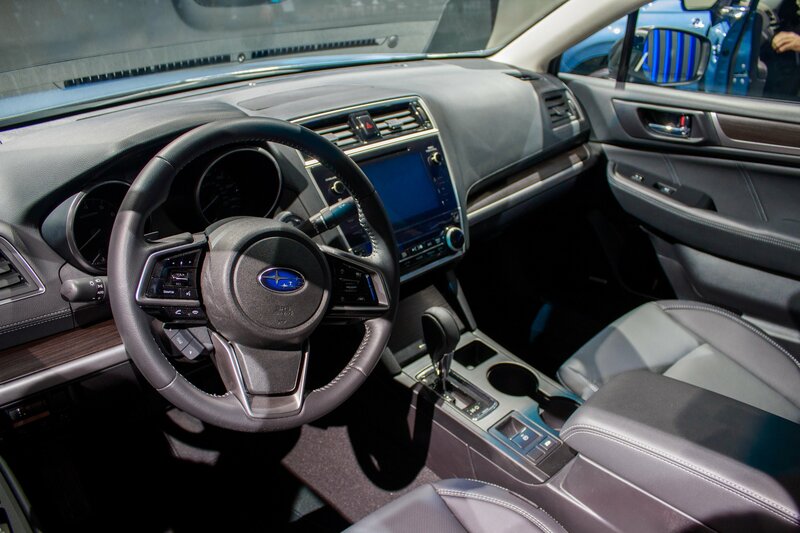 EyeSight also includes the 8.0-inch Starlink infotainment system with navigation, high-beam assist, and LED headlights with steering responsive turning. Now let’s jump into what makes the 2018 Subaru Legacy 50th Anniversary Edition special. The most noticeable change is the color – Subaru’s Heritage Blue. It’s accented with satin chrome mirror caps and grille inserts. The 18-inch wheels are painted in a medium gray color that differentiated them from the standard Legacy’s wheels, despite them sharing the same design. Last but not least, a 50th Anniversary Edition badge is fixed to the front fender like an official seal to the special edition. Inside, the 2018 Legacy 50th wears the same interior as conventional Legacy Limited, but its black leather seats come with gray contrast stitching and the 50th Anniversary logo embroidered onto the seatbacks. Silver seatbelts also set this Legacy apart from its conventional counterparts. Like normal, Subaru gives customers the choice between the standard 2.5-liter Boxer flat four-cylinder or the peppy 3.6-liter Boxer flat six-cylinder. The 2.5i offers up 175 horsepower at 5,800 rpm and 174 pound-feet of torque at 4,000 rpm. The enthusiasts’ choice is the 3.6R with 256 horsepower at 6,000 rpm and 247 pound-feet of torque at 4,400 rpm. Both engines are constructed from aluminum for reduced weight and feature variable valve timing – what Subaru calls Active valve Control. Both are also Boxer engines, meaning they are horizontally opposed, flat-style engines. This keeps the engine’s center of gravity rather low, helping with vehicle handling. Both engines come paired with Subaru’s Lineartronic Continuously Variable Transmission. While not the most engaging transmission, the gearbox does help improve fuel economy. The 2.5i Legacy is EPA-estimated to get 25 mpg city and 34 mpg highway, while the 3.6R is estimated to get 20 mpg city and 28 mpg highway – both on regular 87 octane gasoline. As for pricing, Subaru is charging $35,995 for the 2.5i Legacy and $38,195 for the 3.6R. Again, both models have limited production numbers of 800 and 250, respectively, so finding discounts probably won’t happen. But for those Subaru fans who want to celebrate the Japanese brand’s five-decades in the U.S., the 50th Anniversary Edition models are a solid way to show their loyalty.